This is the third year that I have served your black eyed peas recipe at my family’s New Year’s Day lunch gathering. Everyone loves it. This year I made a double batch and now have lots of left overs. Have you tried freezing it? If I cook this in my instant pot, would I still add all the veggies or add at the end? Would you cook for 25 minutes on high, natural release? I am so excited to try this recipe and have the black eyed peas soaking right now to make for tomorrow! Instead of using the slow cooker (and I am a HUGE slow cooker fan), I will be attempting this in the electric pressure cooker instead. Thank you for making cooking fun, healthy eating possible, and weight loss exciting! 2017 was a life-changer in our family because of you, and 2018 will be starting the year with your deliciousness once again! Thank you! You’re welcome Amy! Happy New Year! I’ve made this for New Years Day the past 4 years and my whole family absolutely LOVES IT!! I just got a new Instapot for Christmas though. Any advice on how to adjust the recipe to cook it in there??? Thank you SO much!! Would love if you would adapt this to an instant pot before New Years! Great recipe and excited to use my new Christmas gift! ???? I love this website! Every single recipe I have tried has been a hit. I love that I can cook delicious AND healthy meals. Thanks so much for sharing these! This is one of my favorite recipes. Works out to 6 SP per serving, as entered into the Recipe Builder. 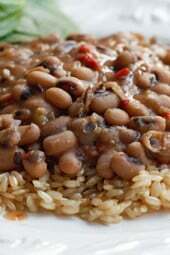 I am from south Louisiana, so I feel like I know a thing or two about how black eyed peas should taste. THIS was the best I have ever tasted. I did make a few changes, but kept the basic premise. I used a green pepper vs. a red pepper, I don’t like the sweetness that a red pepper adds to dishes. I also left out the cumin and chili powder as I didn’t feel there was a need for it. I used ham hock, as well. AMAZING, AMAZING, AMAZING. All your recipes crush it out of the park. Can’t wait to eat my lunch of leftovers. do you think I could use a bag of frozen black eyed peas? Hi do you happen to have a general idea of how much sodium is in this? Thanks! How would I cook these in a power pressure cooker? Would I have to soak the beans overnight? Would I use the same amount of water? You've outdone yourself again – this recipe tasted great. We made a double batch, and ended up needing to incorporate a 2nd crock pot, and then the black eyed peas were a bit tough still at the end of the cook time, so we boiled the stew for a bit in a pot on the stove. Do you think putting the tomato, onion, garlic, jalapeno, and pepper in a food processor instead of dicing it all would work? I don't mind the flavor…I just don't like eating the chunks. Didn't have black eyed peas so I used black beans and it was delish! Made this tonight for New Year's Eve, may not have any leftovers for tomorrow! Delicious! Have you ever just thrown all the ingredients in from the beginning? Can you use frozen black eyed peas? Fantastic!! Cooked these peas for dinner and my husband said they were the best black eyed peas he'd ever eaten!!!! And thats a southern boy talkin….he's been eating black eyed peas for a long time!! Made this tonight and we loved it.. Only thing I did different was add 2 cups do chicken broth and 2 cups of water. Oh and instead of salt, I used garlic salt. We loved it, thank you! I served this over mashed cauliflower instead of rice and it was delicious!!!!! Simply scrumptious. There were no left overs for lunch tomorrow, yum. Ok, this is delicious. I think next time I will cut back on the cumin, but it's still so good. I love black eye peas. I just made this and it is GREAT. I dont eat pork so I used about smoked turkey. I also did not de-seed the jalepeno, I just did not use the whole jalepeno. I am going to eat this with wild rice. Made this for dinner today and it was so good. Loving your recipes. Keep them coming. Just made this dish – another winner! Incase it helps, I always cook dried beans in my crock pot and have never soaked them over night first. I just throw them in, cover them with water (seasonings depending on what dish I'm making) and cook them on high for about 4 hours. I've done 15 beans, black beans and now these, and they always turn out great. Just thought I'd share incase you want to skip the first step. Thanks again for all your wonderful recipes! I am making my way through many of your recipes and last night we did this one. It was a huge hit, even with my picky teenager and my husband, who normally isn't a fan of black eyed peas. Great dish! Yum! I had never had black eyed peas before, but had a big ham bone and gave this a try. 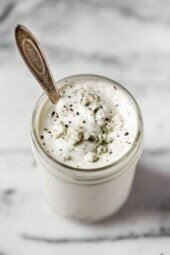 I loved this recipe and all the others I have tried from your site. These were delicious! 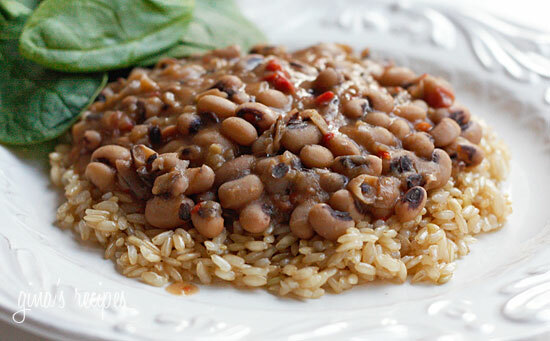 I had never tried black eyed peas before, so I was a bit afraid…but hubby and I both had two helpings. I didn't have a jalapeno, so I added a bit of hot sauce at the end. So good! When growing up in Louisiana, my mom would cook fresh peas with okra from the garden. I made these with a few small changes and they were amazing! I used 1/2 lb dried black eyed peas, subbed the tomato for a can of Rotel tomatoes, used half beef stock and half water (since I didn't have a ham bone handy), swapped the chili powder for Tony Cachere's and cayenne, and added 8 oz frozen chopped okra for the last hour. My husband had never had black eyed peas and even he enjoyed it. I always enjoy making dried beans in the Crock Pot and will be repeating this one many times! 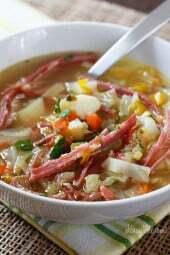 I was adding this to my menu for the week to use leftover ham hocks from making this for New Years Day. Then, I remembered that this was the first Skinnytaste recipe that I ever made. Awwwwwwww!!!! It's so delicious and they've all been winners ever since. I made your recipe for 3 bean turkey chili and I love it. Made this recipe today . I used ham hocks ( just for flavor) and used all of the jalpeno (seeds included) so i could eliminate the chili powder and cumin. It was really great for New Years Day dinner. Thank you for your posting your recipes. If you do ever put out a cookbook I will support. LOVE this site. Healthy, delicious recipes. Trying to eat healthier as a family since our daughter was diagnosed with Type 1 diabetes. Having carb counts on the recipes along with WW points is great. Every recipe we have made so far has been a hit! Today is black eyed peas with ham, my daughter loves it. We enjoyed the pumpkin cupcakes too. Thanks for having such a great site! Your site is WONDERFUL! So far every single thing I have cooked has been amazing! No disappointments. I cooked this tonight and was once again pleased with the outcome. Tons of flavor. Thank you soooo much for sharing wonderful recipes with the weight watchers points included…it helps me still eat wonderful food and stay on plan! OMG! This is so good. I rinsed the peas real good then put them in the 8 cups of water. Let it sit overnight. I DID NOT TOSS THE WATER. I transferred the peas with the 4 cups of water they soaked in. I left out the cumin. It came out perfect. I think next time I'll add the ham about 1/2 way through. Yummy! This sounds sooo good! But the boyfriend doesn't eat pork. Any ideas for a good substitute? Smoked turkey, maybe? AWESOME! I can just have these for dinner and nothing else. I am so glad I found your site! I have made 3 things since I found your site last week and everything turned out great. I have passed this site on to my family and friends! Gina, this is another keeper. I made it tonight and my husband and I loved it. I told him I was going to make one of your recipes every night! Thank you so much! Lia, I know, seems to easy! You can make any dried beans this way, the ham gives it great flavor. Curry-Ham hock would be great, the points would be lower depending on how much ham goes in. Oh my goodness, this was great. I admit I was skeptical thinking "water, beans, ham…how is this going to be good?" But I'm so glad to be wrong. I used a 1.1 lb ham steak since that was the smallest I could find at Trader Joe's, left out a bit of the beans because I have a small slow cooker (3.5 qt I think), and omitted the tomato. I cooked for 8 hours on LOW, then added the veggies for another hour (with extra jalapeno). Sooo good. Thanks, Gina! Made this Saturday night. Everyone ate this dish up (husband & 3 young college students)! Only complaint was made everyone gasey (haa haa), but they ate it again for lunch the next day. Not sure how to remedy that "gas" issue. Very easy to make. Gina, I've recently learned and confirmed that if you use boiling hot water or broth instead of cold when cooking beans, they cook within 2 hours on high in the crockpot or oven, and don't need soaking overnight! Great if you want to do a crockpot bean recipe and didn't think to soak beans then night before. Very yummy!!! This was a perfect meal for a cool fall evening. made this last night…and it was delicious. I used ham hocks to flavor…didn't eat. Cut up some turkey smoked sausage for the meat and omitted the ham altogether. Deleted the tomatoes and jalapenos, and subbed a can of rotel tomatoes. I wouldn't think the ham hock would change the points, since it was removed and not eaten, and didn't cook down enough to let any of the ham inside of the beans….but that's just my opinion. I have a question could I use a ham hock instead? And since I would not be cutting up the ham hock it would just be for flavor would the points be different or the same? I would say 8 hours on low before adding the veggies. Forgive me if this is obvious as I'm new to the world of crock pots, but how long would you suggest to cook this on low for the first part (before adding the sauteed veggies)? I love pinto beans cooked in the slow cooker too. Try them sometime. I make them with ham sometimes, and sometimes I add jalepenos and browned lean ground beef at the end of the cook-time. Serve with cornbread crumbled into the bowl of beans. Yum! Thanks for the recipe Bev! And thanks for the encouragement to write a cookbook. @All the latest- I always use my pressure cooker for beans! A great way to make beans in half the time! Thanks Jen!! Great idea using Smoked Turkey Keilbasa! I always buy the lite one, so good! Would be perfect in this dish! Love the idea of eating it with a little onion on top. And the cornbread sounds like a great idea! @curledwithcass- I would love to have a cookbook, hopefully it will happen soon! If you join plantoeat (you can try it free, click on the button in the left column) it's a great meal planner that you can add my recipes or recipes from other sites, then it gives you a shopping list for the week. Really helpful! I am from the South and love blacked eyed peas! However, I am not currently on WW anylonger I wish I had found your blog last year when I was! (I lost 45lbs!! )…I am thinking of slicing some Smoked Turkey Keilbasa up inside this dish…and I won't forget my cornbread!! We always served it up with sliced raw onion…its so good! One of my favorite dishes! I usually use the canned peas for a quick and satisfying meal. Gonna try this since dry beans/peas are more economical. Oh this sounds delicious. Super dumb question: If you use a ham bone, is it raw before you put it in the crockpot? Hmm, maybe I should stick to a ham steak (that's already cooked, right?). Gina, another great way to fix beans is in a pressure cooker. I have an electronic one, I don't presoak beans, I just put a lb. package of beans in the cooker with 6 cups of liquid and whatever seasonings I want, pressure cook it for an hour and a half, the beans come out perfect every time. It sounds like a long cooking time, but you don't have to watch them, because it's electric, try it, it's an awesome way to fix beans! I love beans that have been cooked with ham – my dad used to make dishes like this all of the time so they always remind me of home. All you need is a good piece of cornbread on the side – yum! I have fallen head over heals in love with your website. 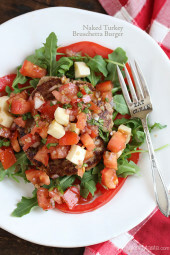 I am new to the wonderful thinking of weight watchers and I heart that your recipes are good, healthy, and fun to make. Keep up the good work! I would love it if you would post a must have grocery list for my cupboards so I can just go home and throw together one of your recipes instead of needing to go out and buy the ingredients every time. PS. I would also heart it if you wrote a cookbook. I would be first in line!